In treating of Evil in relation to Theodicy it is quite impossible to leave out of consideration metaphysics and epistemology. The views of sin will vary as the conceptions of God and man vary. If we view God as infinite, eternal, and immutable in His being, intelligence, and will, and man his organic creation, if we accept the supernatural, grant the need of special revelation, accept the fact of special revelation and the fall of man, we must needs also come to the Biblical view of sin with redemption and restoration. If on the other hand we deny these premises, we must begin with man and experience as we find them, and construct our own views as to the nature of God and man and therefore also of sin, and we come to a fundamentally different theory of Theodicy. 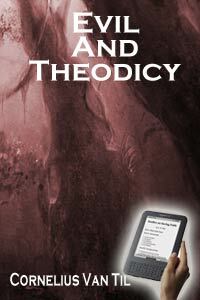 We have accordingly two main theories of evil and two kinds of theodicy. The one is the product of a system of thought that bows before the authority of supernatural revelation and studies the phenomena of experience in the light of the Scriptures. The other is the product of the philosopher who also views the phenomena of experience but feels that it devolves upon him as a rational creature to give an account of things to himself, and that he is able to do so. This may lead him to skepticism or phenomenalism but he will not seek aid from supernatural revelation. "The philosopher as philosopher and irrespectively of his attitude toward the Christian faith, approaches a question as if there were no truth which claimed to be revealed. For him the plan of the world may or may not have been divinely disclosed to man; it awaits discovery or interpretation through the exercise of reason."